Is the Lhasa Apso right for you? Find your perfect match now! 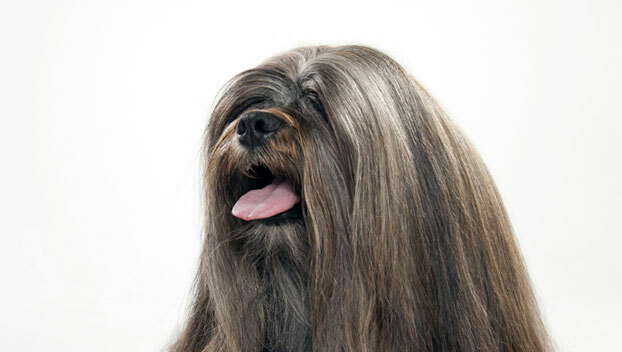 An ancient breed, Lhasa Apsos were cherished watchdogs in Tibetan monasteries. And these dogs did more than guard the monks — if a monk (or lama) had lived a good life, he would reincarnate as a Llasa Apso! No wonder the lamas took such good care of their Lhasas. These dogs do seem to have unlocked the secret to long lives, in any case: the oldest known Lhasa Apso lived to be 29 years old. The Lhasa Apso is something of a diva: she's gorgeous, intelligent, and lively — and she knows it. 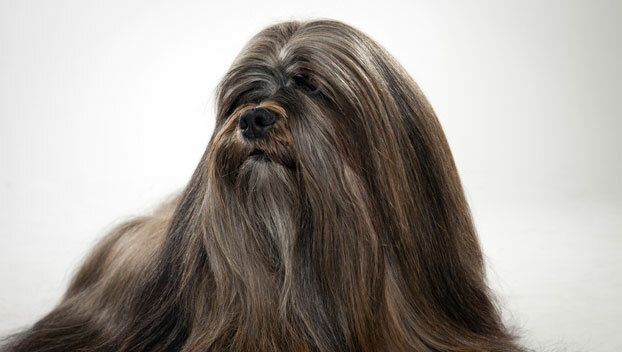 This is a very popular breed that first came to the United States with his Holiness the Dalai Lama in the 1930s. Originally from the Himalayan region of Tibet, this small-sized and medium-energy breed can grow to between 13-15 pounds and lives an average of 12-14 years. The breed is recognized by the American Kennel Club and classified as a member of the Non-Sporting group. WHAT IS A LHASA APSO'S PERSONALITY LIKE? Lhasa Apsos are cuddly couch potatoes, which make them a good match for laid-back types or older owners. They love to play with kids and are devoted to their chosen people. Lhasas can be shy with strangers however, and frankly can't be bothered much with non-family humans. They're divas, remember? WHAT IS LHASA APSO BEHAVIOR LIKE? 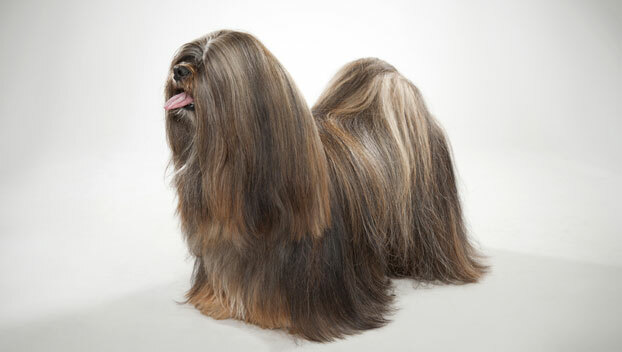 A Lhasa Apso should get daily exercise, no matter what this dog tells you. They'd be happy to cuddle with you all day, but it's important to keep their sharp minds active — even if your Lhasa makes some very good points about how nice a nap sounds right now. Their sharp hearing and alert nature makes them vigilant watchdogs. No visitor or delivery will ever take you by surprise with this dog in the house. They're very loud barkers. HOW EASY IS IT TO TRAIN A LHASA APSO? These divine canines are intelligent and can be a bit stubborn. This breed is somewhat resistant to training, and may be slow to housetrain. Use lots of positive reinforcement, especially treats, to convince them what you're asking for is worth doing. Early, frequent socialization is essential. Start training while your Lhasa Apso is still a puppy and be patient and consistent with your furry friend. They can be good canine citizens at the dog park but will be most comfortable on the small dog side. HOW MUCH DO LHASA APSOS SHED AND WHAT ARE THEIR GROOMING NEEDS? 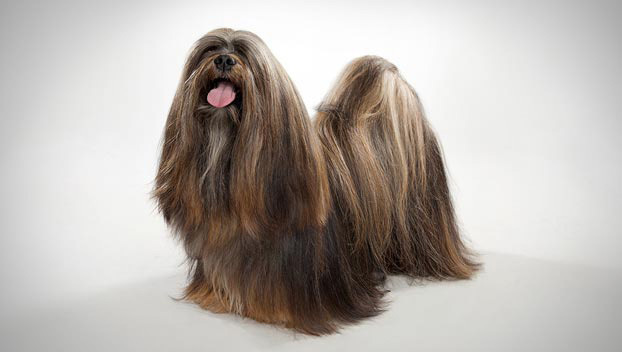 This breed's coarse, heavy double coat is made of long, lavish, flowing hair. Those gorgeous long locks collect dirt and debris, so the amount of grooming your Lhasa Apso will need depends on her cut. 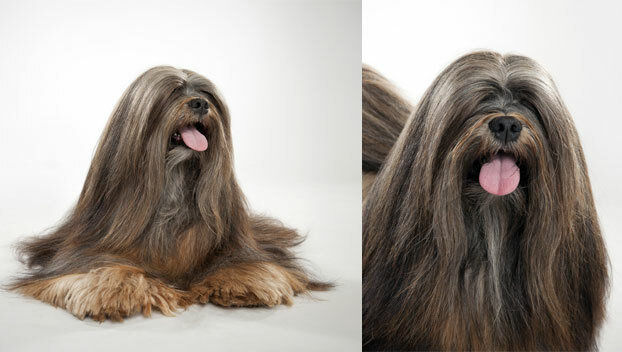 Regardless, this couture canine will require regular grooming, brushing, and combing to prevent tangles and mats. These dogs are light shedders. WHAT HEALTH PROBLEMS DO LHASA APSOS HAVE? Lhasa Apsos are a hardy and very healthy breed — these dogs can live to be more than 20! Be sure to check and clean their ears often to discourage infection. ARE LHASA APSOS GOOD FOR PEOPLE WITH ALLERGIES? The American Kennel Club doesn't list Lhasa Apsos among its breeds recommended for allergy sufferers, but their light shedding might make them a possibility for folks with mild allergies. You can reduce your furry friend's impact on your allergies with frequent baths and brushings to reduce loose hairs and allergy proteins in your pet's dander. Use a damp cloth to wipe off your dog after playing outside. Smaller dogs have less surface area, so they produce comparatively less dander than larger breeds — definitely something to keep in mind with a dog as small as a Lhasa Apso! Remember that no breed is 100% hypoallergenic, and any breed can aggravate allergies. WHAT IS A LHASA APSO'S BEST DAY? Your Lhasa Apso wants to do whatever you want to do (unless you want to go swimming — they're not particularly strong swimmers). But games in the yard, a trip to the dog park, a movie on the couch? Those all sound great to this pup. SHOULD I ADOPT A LHASA APSO? These dogs are very adaptable to many environments and are recommended for folks living in cities and apartments. They don't mind the cold—they're from the Himalayas, after all!—but they do tend to droop a bit in the heat. If you don't mind a bit of sass in your constant companion and you're willing to keep up with grooming, the Lhasa Apso is an agreeable and attractive choice. Have you decided that a Lhasa Apso is the perfect dog for you? Why not be your new best friend's hero and adopt a rescue! Be sure to check out our article on what to expect when you're adopting a dog or cat.